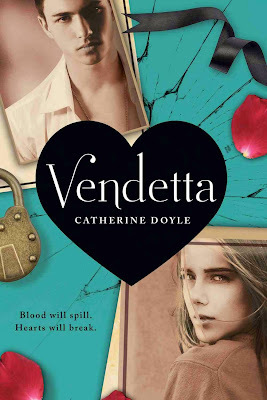 Vendetta is one of the hottest messes out there, and yet somehow, it manages to get me smiling every time I think back on the story. If even a single part of the plot had been the least bit different, this book would have been a complete disaster, but somehow, someway, the author manages to put everything together in such a manner that one can't help laughing at the sheer risk of it all. I switched back and forth from not being able to take my eyes off the page to wanting to throw this book on the floor and stomp away, but the last chapter sealed the deal for me: I crave book two. When I first read the blurb and saw that this was one of those mafia romances, I wasn't too sure about whether or not it would be worth the read. However, the cover had sparked my interest, and after reading about the several boys next door, as opposed to the single boy next door I'm used to, I had to check Vendetta out, for better or for worse. Thankfully, it was for better. I was hooked from the beginning of the book, though I must admit that there was a bit of a Twilight feel to the whole thing. Nevertheless, I'm glad I kept reading, because it was only nearer the end that the whole mafia thing really kicked in. Before that, there was the mystery of who the new boys next door really were, and I'll admit, even knowing that it was mafia-related, my head was about reading to burst with curiosity. It turns out that it is in fact very annoying when the main character just wants to be with the guy, and the guy is all, "I like you, but it's too dangerous." It's actually surprising, because usually I'm all for that line, but in this book, it simply served to annoy me. I suppose Nick would be the main love interest in this book, but no way was he my favorite. I'm more drawn to the bad boys than the good ones, and it was the same in this story. Nick was the nice brother, the one who fell in love with Sophie as soon as they first saw each other, and who was eager to be with her despite the dangers his family posed her. He defended her against his other brothers, and luckily for him, she liked him just as much. And then of course there's Luca. He's the bad bad boy, the one who insults Sophie at every turn, and heck, he even scared me every now and then. He was moody, secretive, and threatened Sophie each time they saw each other. Guess which one I fell in love with? The last scene, where the mafia bits of the story are put into play and true identities are revealed, is the single best part of this book. Not only is it action-packed and suspenseful, everything you think you know is turned upside down, fast. And then of course there's the fact that at a certain perfect scene near the end, I swooned embarrassingly hard (I regret nothing). This book had a field day with my feels while I was reading it, and it couldn't have been more breathtaking. Looking back, I couldn't be happier that I somehow stumbled upon this book, because it is one of the single best things that have happened to me this year. Even now, I look at this book and I grin, quite manically. Several of the characters in this book - like Luca - are just oh so precious, and I can't wait to see what happens to them all in the next installment to the series. I know I was unsure about the mafia plot at first, but I'm really hoping that it takes up a bit more of the storyline in the next book. And of course, being me, I'm kind of desperate for some Luca/Sophie moments. I have some pretty high expectations for the next novel, and I can't wait for it to live up to them. Book Synopsis: When it comes to revenge, love is a dangerous complication.With a fierce rivalry raging between two warring families, falling in love is the deadliest thing Sophie could do. An epic debut set outside modern-day Chicago. When five brothers move into the abandoned mansion in her neighbourhood, Sophie Gracewell's life changes forever. Irresistibly drawn to bad boy Nicoli, Sophie finds herself falling into a criminal underworld governed by powerful families. As the boys' dark secrets begin to come to light, Sophie is confronted with stinging truths about her own family, too. She must choose between two warring dynasties - the one she was born into, and the one she is falling in love with. When she does, blood will spill and hearts will break. Source: Purchased the ebook for my Kindle.